Axial RC Inc. is proud to announce that Pro Boat Models has been added to the sponsor list for AXIALFEST 2018! Pro Boat Models brings the fun and excitment of radio control watercraft to modelers in scale versions of popular boat types and beyond. Each Pro Boat Model has been designed from the ground up with quality and performance in mind. Whether you are into hydroplanes, deep-v hulls, scale boats or just want something fun with self-righting ability, Pro Boat has the perfect boat model to add to your RC collection. Axial RC Inc. is proud to announce that Spektrum has been added to the sponsor list for AXIALFEST 2018! In October of 2004, Horizon Hobby rocked the RC world by unveiling one of the most revolutionary products to ever hit the market: Spektrum 2.4GHz Digital Spectrum Modulation Technology. Similar technology in the computer and telephone industries has eliminated interference, increased signal resolution, and provided a stronger link between the base units and the transmitting units. Since then, racers and pilots have embraced Spektrum technology, and the future is even more promising. Over the years Spektrum has brought major advancements with it’s products. Starting with the DX3 and DX6 years ago, the line of Spektrum products now includes some of the most advanced air and surface RC equipment in the world. Axial R/C Inc. is pleased to announce Tower Hobbies as a returning sponsor for AXIALFEST 2018! Tower Hobbies has been a continued sponsor of AXIALFEST since 2014. Tower Hobbies has a very simple game plan: offer the finest products available at the lowest prices and to provide absolutely the finest service. This game plan is a lot more than just a plan — it’s a promise. A promise that is honored by each and every dedicated employee of Tower Hobbies. All of the dedicated employee-owners are Team Tower Hobbies and their personal and professional commitment to excellence is your guarantee of total satisfaction and outstanding value. Axial is stoked to announce that Pedals Bike Shop of Riverside, CA is back as a return sponsor and is donating an SE Bike to the massive raffle pile! 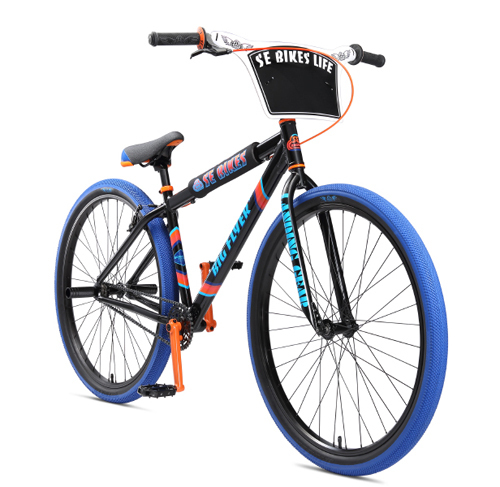 This SE Bikes Big Flyer 29″ will be given to a lucky raffle ticket winner during the AXIALFEST2018 Awards Ceremony! How do you get your raffle ticket? Show up to the Awards Ceremony! The SE BIkes 29” Big Flyer is “wheelie” a dream come true! SE went deep into the design lab this year to create the raddest, baddest and most affordable 29” BMX bike on the market. This ground-breaking bike wheelies like a dream and comes equipped with an SE Bikes pad set, Rad Plate and Wheelie pegs. PEDALS, a full service cycling boutique committed to putting custom back into the customer experience. In other words no matter what type of riding you’re into we’ve got you covered and we’ll make sure you get the proper fit and equipment to get you rolling. Axial RC Inc. is proud to announce that Monster Energy has been added to the sponsor list for AXIALFEST 2018! Most companies spend their money on ad agencies, TV commercials, radio spots, and billboards to tell you how good their products are. At Monster we choose none of the above. Instead, we support the scene, our bands, our athletes and our fans. We back athletes so they can make a career out of their passion. We promote concert tours, so our favorite bands can visit your home town. We celebrate with our fans and riders by throwing parties and making the coolest events we can think of a reality. Some companies won’t let you have any gear unless you’re on the payroll. We’re all about our fans rockin’ the Monster logo the way they want – on hats, shirts, mx bikes, trucks, gear, or even on themselves. Our idea of a promotion isn’t giving away a TV you already got. Our promos offer exclusive VIP access, insane trips hanging with top musicians and athletes, and real gear like dirt bikes, snowboards and helmets. In short, at Monster all our guys walk the walk in action sports, punk rock music, partying, hangin’ with the girls, and living life on the edge. Monster is way more than an energy drink. Led by our athletes, musicians, employees, distributors and fans, Monster is… A LIFESTYLE IN A CAN! Axial RC Inc. is proud to announce that Horizon Hobby has been added to the sponsor list for AXIALFEST 2018! Horizon Hobby is an international developer, marketer and distributor of radio control (RC) hobby products such as Axial Racing, Team Losi Racing, Losi, ECX, Spektrum, Arrma RC and also specializes in model trains and a wide range of educational, toy and other hobby products. In addition to providing customers with the highest standards of product expertise and customer service, Horizon Hobby haa established lasting relationships with retailers by being exceedingly attentive to their needs. These factors, along with a high level of integrity, have helped Horizon earn a trusted reputation throughout the industry. Axial R/C Inc. is pleased to announce REEF’S RC as an official sponsor for AXIALFEST 2018! The owner of REEF’S RC started the business to help out his fellow RC friends that wanted to keep up with the big spenders and the big name servos. He had the means to make this happen, and did. REEF’S RC made a few servos for his friends to try and have fun with…then boom…the word spread, and REEF’S RC came to be. REEF’S RC stays down to earth, and cares about this hobby and the people behind it. Not only does he love the RC Cars & Trucks, the building, the ingenuity, the fun, but most importantly…the friends and people in this hobby. With REEF’S RC in Italy, China and the US there was opportinity to make something great. Engineering gears in Italy, sending them to China to be installed into a GENERIC Casing (To Save People Money), then send them to the US to be packaged, labeled, and shipped to be enjoyed. This vision is now, and will only get stronger as the servo game is simplified for all. Crude But Effective RC FABrication specializes in innovations for your RC. Based on the principle that taking the time to build your vehicle from the chassis up is a great experience for all. Our products are economical and easy to use for everyone from the beginning builder to the more seasoned hobbyists. Our collection of tabs and brackets assist with simple fixes to link and shock geometry. Now get out there and build something! Axial R/C Inc. is pleased to announce Holmes Hobbies as an official sponsor for AXIALFEST 2018! Holmes Hobbies LLC was founded in 2005 by John Holmes with the goal of providing better electronics to the emerging sport of R/C crawling. Since then, the business has grown into a domestic designer, motor manufacturer, and international retailer and wholesaler. Besides their own products, Holmes Hobbies also distributes Castle Creations and Tekin Racing electronics. Holmes Hobbies focuses on both brushed and brushless systems for off-road use, emphasizing superb control and power for an unparalleled driving experience. Axial R/C Inc. is pleased to announce Phoenix Design as an official sponsor for AXIALFEST 2018! Phoenix Design offers custom LED light options for your scale off-road crawlers. LED Housings are offered in various sizes and can be custom mounted to most available rigs.